12:36 – A new Giraffe is born! 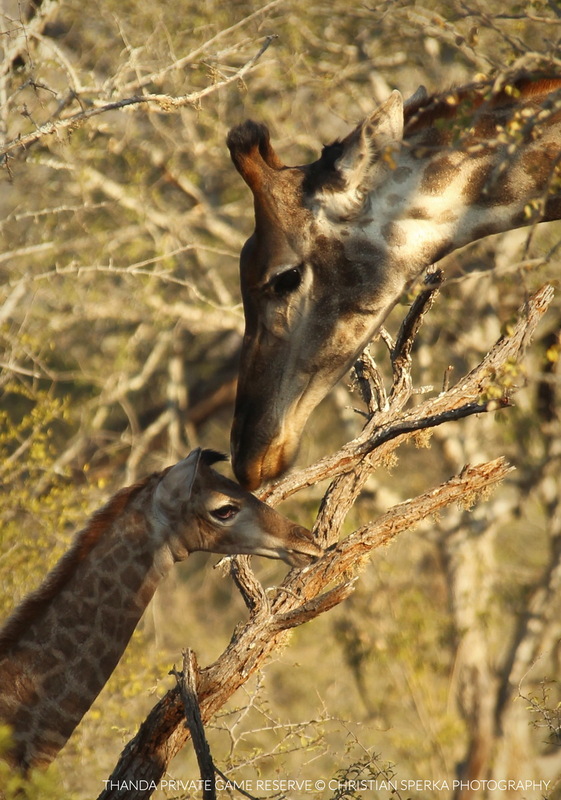 Thanda’s youngest Giraffe calf was born today at precisely 12:36. Members of the Thanda Wildlife Team observed the birth of the young boy and stayed with him and his mum until he was ready to walk properly. It took over four hours from the first appearance of the legs until his 1.80m fall into life. After he hit the ground it took him thirty minutes before he raised his head and it took another 1.5 hours before he made his first successful attempts to stand. As soon as he was firmly on his feet he started looking for milk and – after a short search – he found mum’s teats. To bond with him and to clean him Mum licked the little one with her long, rough tongue. For the actual birth (from the appearance of his head to his fall to the ground) his mum was hiding behind a thicket. There are no images of this as a closer approach would have disturbed her during her labors. At 15:30 mother and son moved off into thicker bush and left the site of his birth. A few Thanda guests were able to observe the first part of the little one’s path to life. What a special day for everyone! 8:24 – The first hoof! 13:25 – The head is up! 14:13 – The first attempt to stand! 14:38 – Up for the first time! 14:49 – Mother and son! 15:00 – Nice and clean! 15:04 – Not too wobbly! 15:08 – The first drink! ← Dad on Safari – what a father’s day gift! Amazing moments, you are so lucky to be there personally! Thank you, Christian. New life always gives me hope.